They say the eyes are the windows to the soul, but physiologically speaking, they’re really windows to the brain. RightEye looks through that window to detect common but often subtle vision issues resulting from concussions and other brain troubles. Its quick, portable eye-tracking station can tell in minutes whether you should see a doctor — or look into becoming a pro ball player. It turns out there’s quite a lot you can tell from how someone’s eyes move. We may not notice it ourselves, but we all vary in how and how well we execute a number of basic tasks, from flicking our eyes back and forth to smoothly tracking a moving target. For instance, your eyes may over-correct, fail to line up correctly, or track up or down when moving along a straight line. For healthy individuals, these variations fall within a safe range, just part of the ordinary differences between bodies. But certain patterns well outside the baseline can be strong indicators of things like concussions and eye muscle problems — and even Parkinson’s and Autism-spectrum conditions. 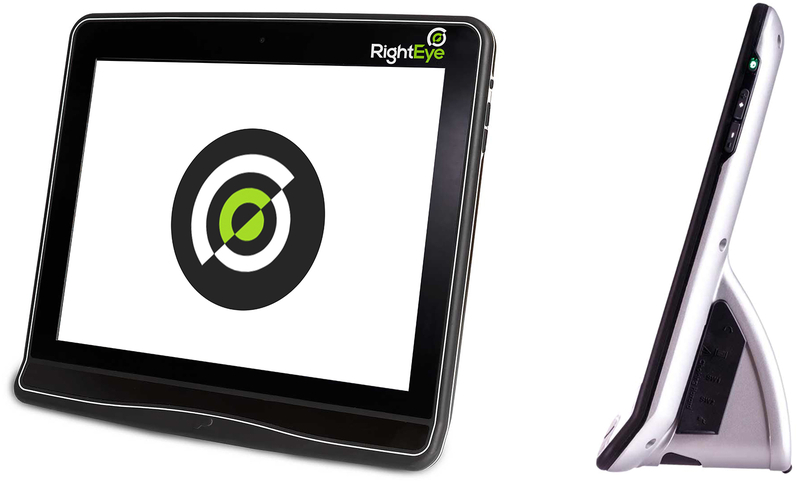 RightEye tracks these movements with a custom device that looks a bit like an all-in-one desktop; it uses a Tobii eye-tracking module built into a single-purpose computer loaded with a library of simple tests. A basic EyeQ (as they call it) test takes five minutes or so, with more specialized tests adding only a few more, and results are available immediately. To give you an idea: one test in game form has you defending a space station, destroying incoming ships by looking at them. But certain colored ships you must not destroy — meaning you have to detect them in your peripheral vision and avoid looking at them. In another test, you flick your eyes rapidly between two targets appearing on opposite sides of the screen, demonstrating accuracy and functioning saccades (micro-corrections made by your eye muscles). Each eye is tracked independently, and their performance as a matched pair is evaluated instantly. An easy-to-understand results sheet shows their actual movements and how (if at all) they deviate from the baseline. It’s compact and can run on battery for some 8 hours, making it ideal for deployment outside hospitals or the like: anywhere from school nurse’s office to the sidelines of an NFL game, even in the home. I tested the device out myself at CES (my vision is just OK, but I want a rematch), and later chatted with Barbara Barclay, RIghtEye’s President. The two most exciting applications of the technology, as judged by her enthusiasm anyway, are in identifying vision-related cognitive problems in kids and in creating a sort of eye fitness test for sporting persons. Say a child is having trouble learning to read, or perhaps can’t pay attention in class. The immediate thought these days is frequently ADD. But it’s more than a little possible that it’s a vision problem. A subtle difference in how the eyes track, perhaps one going off the horizontal when tracking a line of text, could easily make reading on the page or blackboard frustrating or even painful. What 3rd-grade kid would keep at it? 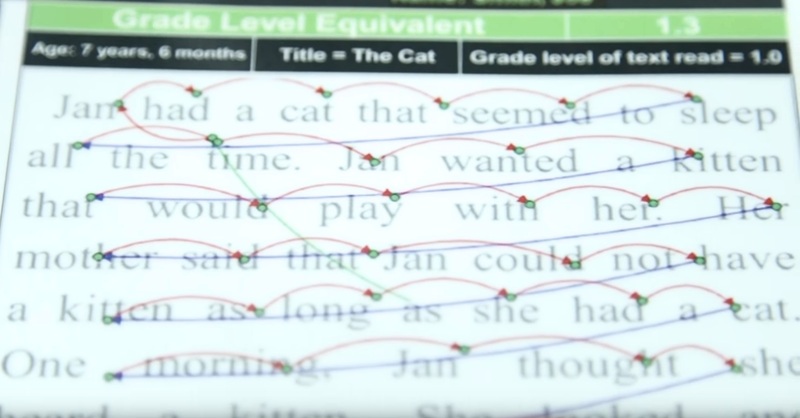 A reading-focused test tracks how the eyes move along a line of text. This isn’t some groundbreaking new idea — but reliably and objectively evaluating individual eye movements was only something you could do if you went to see a specialist, perhaps after other explanations for a behavior didn’t pan out. RightEye’s test practically runs itself and can detect or eliminate the possibility of vision problems in minutes. Honestly, I think a kid might even find it fun. Barclay has personal experience with this, her own daughter having had health issues that only after multiple false starts were found to have their root in a relatively simple vision problem the system indicated. 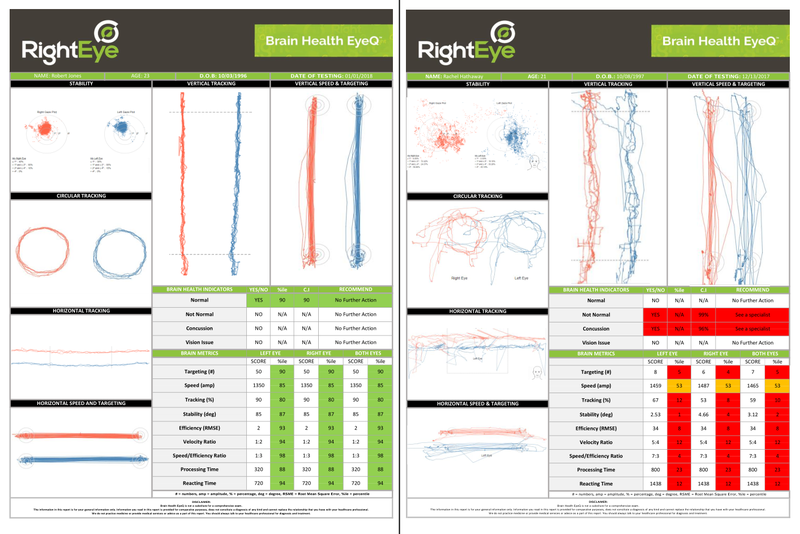 In 2016, RightEye acquired the rights to a pair of tests based on research linking eye movement patterns to Parkinson’s and Huntington’s diseases, as well as Autism spectrum conditions. It’s not a magic bullet, but again, the quick and easy nature of the tests make them ideal for routine screening. The Autism spectrum test is for children aged only 1 to 3, and watches eye movements between images of people and images of geometric shapes. Lingering on the shapes more than the people, it turns out, is a good indicator that at the very least the kid should receive further testing. The Parkinson’s and Huntington’s tests watch for the more well understood patterns that accompany the motor degeneration found in those afflictions. 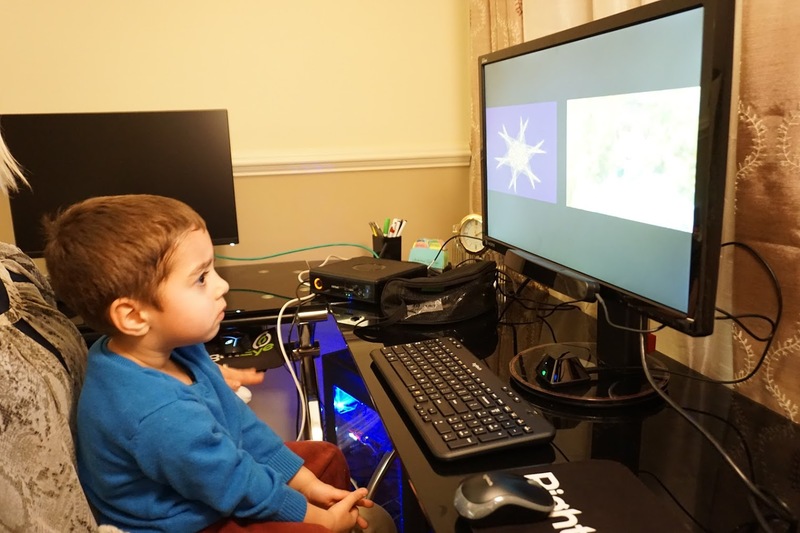 They can be administered to people of any age and have (using earlier eye-tracking setups) contributed to many identifications of the diseases. On a very different, but perhaps more immediately remunerative, note, Barclay told me that the test also works as a way to find outliers on the other end: people with what amounts to super-vision. It’s entirely possible that someone could take the test and their results will show that they have faster, more accurate saccades, quicker target acquisition, and better continuous object tracking than the baseline. That’s a heck of an asset to have if you’re batting, fielding, goalkeeping, playing tight end — pretty much anything, really. Examples of a healthy eye movement report (left) and concussed one (right). It’s also a heck of an asset to have if you’re a scout or coach. If Lopez is catching great on the left side of the field but not the right, you can look into the possibility that he’s having trouble tracking the ball when looking over his left shoulder, his eyes all the way to the right. Not only that, but you can test for effects of concussions or other traumas right there on the field if they’re having trouble. Given how widespread such injuries are and the immense danger of repeated concussions, testing early and often could literally save lives. Right now, Barclay told me, 7 MLB teams are using RightEye tech for player assessments. As for the medical side of things, she said the company currently has 200 clients. The new hardware should help boost that number. Perhaps more importantly, it has the backing (and therefore clout) of VSP, the country’s largest vision insurance company. That’s both a tremendous vote of confidence and a major in — nothing gets people using a system faster than knowing it’s covered by their existing insurance.